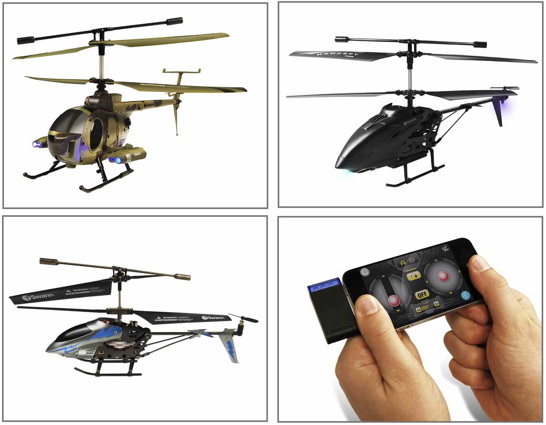 Santa Fe Springs, Calif. – Today, Swann proudly introduces three new additions to its line of RC helicopters: two that feature on-board wireless video cameras and another that is controlled by iPhone™, iPod™, iPad™. The Sky Eye and Black Swann let users record their flights as videos or still images with the touch of a button and easily share with their friends via the included USB cable. Swann's i-Fly Micro Lightning™ can be operated by either the included IR remote or by an Apple® iDevice with the included adaptor for iPhone™, iPod™, iPad™ and Swann's iFly application. Swann's helicopters feature Easy-Fly Gyro Technology, trim adjustment for added stability and dual joystick controls on the infrared remote control for 6-way multi-directional flying including up/down, forward/backward, left and right turns. Each helicopter is powered by a lithium ion battery that can be recharged from the cable in the remote control or via USB cable into your PC. The IR remote control is powered by 6 x AA batteries (not included) with an indicator light to assist with charging. Swann's RC helicopters are designed for indoor flying for ages 14+, include a spare set of replacement rotors and a bonus landing pad game. Swann's RC helicopters will be available for purchase from Fry's Electronics, BrandSmart, and other major retailers coming soon.